HOLIDAY HOMES, HOUSES & COTTAGES TO RENT IN NORTH YORKSHIRE, ENGLAND. 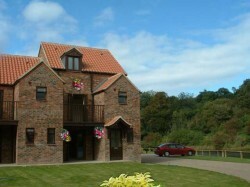 Welcome to our selection of holiday homes to rent in North Yorkshire, England. North Yorkshire is a phenomenally endowed natural area comprising of the North York Moors, most of the Yorkshire Dales and the Pennines � the backbone of England. The former is laden by sandstone and limestone rocks tiered from the Jurassic periods and weathered from storm and water draining into the rivers of Esk, Derwent and Rye. The Yorkshire Dales also form a national park alongside that of the North York Moors. These undulating hills with their picturesque tumbling falls drain into the River Ouse before arriving at the Humber. This abundance of national park covers a whopping forty per cent of the country and attracts many visitors. York is the traditional county town and offers a wonderful array of sightseeing attractions. The forefront is the collection of York Castle (commonly called Clifford�s Tower), the cathedral � York Minster; and its City Walls that parade above great floral displays evident from these ancient walkways. These are all open daily barring maintenance and special occasions. York and its county has many museums that tell of the many ages of Britain from the early Mesolithic to the civilisations of the resilient Romans, the rampage of the Vikings and the structural ascent of the Normans and the reign of kings that William the Conqueror began. The Yorkshire coast has a generous 45 miles of white-sanded beaches, craggy and cliff-side laced with fishing villages and family resorts. Some of these are given the Blue Flag � the estimable European award for cleanliness and environmental friendliness. There are also many amusement parks some such as Log Heights that takes in the natural panorama with challenging rope courses. Scenic and normal railroads offer a lovely way to travel and there are also biking trails and pony trekking that also offer an ambient alternative. These are but a few of over two hundred attractions in this county and naturally this lends heavy to wonderful golf courses. Looking for self catering holiday accommodation in North Yorkshire, then below is a selection of houses, holiday homes, flats and holiday cottages in North Yorkshire that can be rented direct from their owners. You can either click on each listing for further details or you can use our search engine on the left if you are looking for something in particular.